This is a metaphor picture about wearing masks. You can see the woman has 2 masks, a red sad face & a green happy face. I was inspired to draw her as a theatre stage actress by the definition of hypocrite (see below). Sermon/teaching theme suggestions: This picture could have lots of sermon applications – commenting on how we try to “hide” our true feelings &/or thoughts from other people, & even God. It could be used to illustrate the futility of “wearing masks” & how self-defeating that is; how the practice isolates use from other people, & prevents us from “being real” with other people, & God. There are lots of things that can be said about this picture! On the one hand the woman in purple in the picture has two masks, showing two states of mind. In a wider interpretation she might represent anyone (male or female) who APPEARS to be one thing, but is in fact something else. Or she might feel vulnerable & so “puts on a mask” to hide her true feelings. There are hundreds of situations we can think of when we all might face this dilemma of showing our true self, or else hiding behind a mask of some sort. Whilst we can “pull the wool over the eyes” of someone we encounter, we can’t do that to God! One of my intentions in drawing this picture is to look at our interactions with God. The woman in the [picture is looking upwards (towards God) & has taken both masks off her face, symbolizing that she realises she can be herself with God, she doesn’t have to pretend to be someone she is not. God knows us. He REALLY knows us… through & through. The Bible tells us that NOTHING is hidden from God. And yet we can still “put on a mask”, even when we are praying & talking to God. It’s nonsense; there is NO WAY we can pretend before the Lord, yet we sometimes do that very thing! When we realise that God sees all we are & accepts us as we are, then we can get rid of our masks & encounter the Lord just as we are, which is exactly what He wants us to do: be honest & be ourselves. God is in the transforming business – so even if we don’t like what we are, with God on our side, & improving us from the inside out, we will soon begin to improve! When we go to church & walk into the building, some of us “plaster on a happy face” & actually hide our true feelings &/or thoughts. We can pretend (successfully) before other people, but not before the Lord, who sees us “warts & all”. What could we do differently? 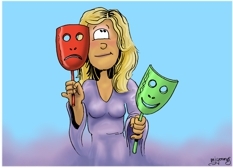 Try taking off the metaphorical mask & show people what we are truly feeling & experiencing. Amongst fellow Christians & at church we ought to be that honest. At church we are “supposed” to be honest & church is “supposed” to be a safe place for us to “let our guard down” & “be ourselves” after all! And even if we are misunderstood in church, at least we know that God “gets us” & accepts us. The word hypocrite apparently comes from the Greek word hypokrit?s, which is a stage actor, hence one who pretends to be what he is not. When applied in the New Testament the word hypokrit?s refers to a hypocrite; a dissembler, pretender, hypocrite: Matthew 6:2, 5, 16; Matthew 7:5; Matthew 15:7; Mark 7:6; Luke 6:42; Luke 12:56; Luke 13:15. 8 “‘These people honor me with their lips, but their hearts are far from me.